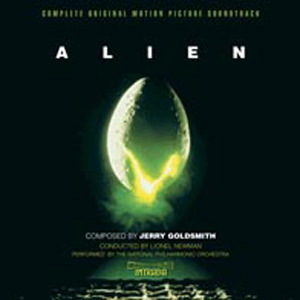 The fifth Soundtrack of the Week is the soundtrack to Alien, a two-CD set from Intrada with more than two hours of music composed by Jerry Goldsmith and conducted by Lionel Newman. The music is very atmospheric and suspenseful with some unexpected flourishes, such as the sudden use of an echo effect or a serpent. Its ominous and haunting qualities make it a good companion to bad moods.